When slip resistance on stairs is a concern, or a requirement, American Bullnose Company can fabricate stair tread. Using a full size tile we bullnose the edge and add indentations for slip resistance. 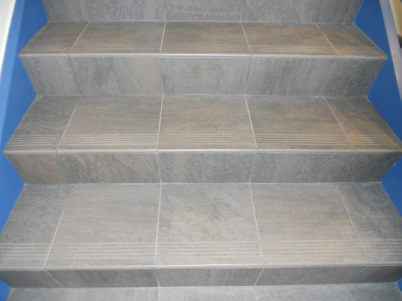 As with other American Bullnose Company services, our stair tread capabilities make your entire tile line available with stair tread tile. The first slip resistant “groove” can be any distance from the bullnose edge. The number of slip resistant “grooves” is up to you. The slip resistant “grooves” can be any distance apart. The edge can be bullnosed or remain a factory edge.